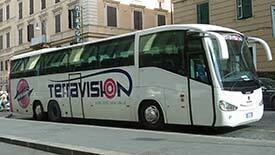 For quick, frequent service to and from Ciampino, it's hard to beat Terravision--assuming that you can get on the next bus, which may be a challenge if several flights dump planeloads of passengers into the Ciampino arrivals terminal at the same time. Terravision's route starts and ends at Ciampino's city center (10 minutes beyond the airport), but this won't affect you unless you're staying in Ciampino. Terravision now has a competitor on the Termini-Ciampino route: Schiaffini's Rome Airport Bus to Termini Station, which offers free Wi-Fi on board and has comparable fares. As you leave the customs area, you'll see an arrivals desk. Look for the Terravision representative, who can sell you a ticket (if you haven't prebooked on the Terravision Web Site) and give you a boarding card. Next, go outside and wait in line for the bus, which usually departs from bay no. 3. You're entitled to priority boarding if you've bought your ticket on the Web, but prebooking will also limit your options if the queue is unpleasantly long. Before boarding the coach, go into the TerraCafé. At the ticket counter inside the door, buy a ticket or--if you've prebooked--show your ticket or Internet voucher. The ticket agent will give you a numbered boarding card for the bus. Once you have your boarding card, you can go back outside to the loading area along the sidewalk. When the driver is ready to begin boarding, you can place your suitcase in the baggage compartment, get in line, hand over your ticket and boarding card, and find a seat. Travel time is nominally 40 minutes, but Terravision recommends catching the bus at least three hours before your scheduled flight departure. Next page: Bus to Metro Line "A"